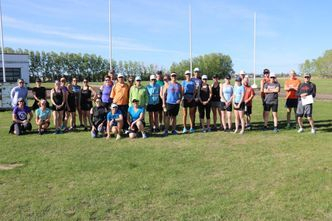 On Monday, May 20th, 2019, holiday Monday, we will be celebrating our 17th Friendship Run between High River and Okotoks. We will be running from the Rodeo Grounds in High River to the Crescent Point Regional Field House at Aldersyde . Start: 9:00 am at the Rodeo Grounds or gather at the Crescent Point Regional Field House to car pool to High River. We leave at 8:30 am. The run will be about 13 km, but is not measured or timed. This is a fun run for club members, friends, and anyone else who would like to join in. Truly open for all. You can run the whole way, do some of it and catch a ride, or do it in a relay. At the finish the Big Rock Runners will host some food and drinks of some kind. Everyone is welcome. Please hand in your waiver form at the start of the race. Check out the 2018 pics. Thank you to John and all the volunteers that make this a great event.